Among their various branches Celtic proved themselves as a distinct race and started dwelling in different parts of Europe of what is now called Spain, France, Germany, Austria, eastern Europe, and the British Isles. Coming of the first Celtic invasion. They are known as Goidels and Gaels. The first expedition of Julius Caesar, the great Roman Emperor on British Isles. Conquest of Britain by Claudius (the fourth Roman Emperor). Roman colony of "Britannia" established. First Germanic tribes arrive in England from the lowlands on the other side of the North Sea./ Departure of the Romans from Britain. Settlement of three great Germanic tribes- Angles, Saxons and Jutes along with some Frisians in Britain. Traditional date of the coming of the Saxons to Britain. Introduction to Christianity with St. Augustine’s arriving in Kent. Rise of three great kingdoms politically unifying large areas: Northumbria, Mercia, Wessex. Supremacy passes from one kingdom to another in that order. Bede’s Ecclesiastical History of the English People. Viking incursions grow worse and worse. Large organized groups set up permanent encampments on English soil. They slay King of Northumbria and start ruling creating a Viking Kingdom called ‘Jorvik’. Wessex remains as a final Anglo-Saxon Kingdom in Britain. Vikings move against Wessex after losing battles. Alfred becomes king of Wessex. During his reign of 15 years, peace and prosperity established in England. He won many battles. For this reason he is called “Alfred the Great”. Athelstan became king. Anglo-Saxon reached the summit of power. Athelstan re-conquered York from the Vikings, and even conquers Scotland and Wales. Danes and English started living together peacefully. Plenty of Scandinavian loan words entered into the English language, like the personal pronoun ‘they’, ‘them’, ‘their’ etc. Battle of Brunanburh: Victory of Athelestan. Athelred became king at the very premature stage (11 years). Aethelred has proved to be a weak king, who does not repel minor Viking attacks. After losing in the hand of Viking, Aethelred flees to Normandy, across the channel. The Battle of Maldon: Byrthnoth defeated by the Danes. King Sveinn of Denmark became the king. Sveinn sets up a Norse court at the new capital of Viking England, Jorvik. Sveinn's young son Cnut crowned king of England. Cnut decides to follow in Alfred's footsteps, aiming for a peaceful and prosperous kingdom. 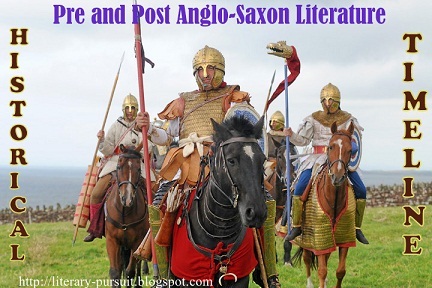 Encourages Anglo-Saxon culture and literature. Even marries Aethelred's widow Emma, brought over from Normandy. Accession of Edward the Confessor, son of Aethelred and Emma. Edward is a pious, monkish man. Saxon period restored. Edward grows a strong partiality for his birthplace Normandy, a duchy populated by the descendents of Romanized Vikings. Especially fond of young Duke William of Normandy. Edward is dominated by his Anglo-Saxon earls, especially powerful earl Godwin. Godwin's son, Harold Godwinson, becomes de facto ruler as Edward takes less and less interest in governing. The landmark period for beginning a new era, The Middle English Period. Norman Conquest. Battle of Hastings between Harold, the final Saxon King and William, the Duke of Normandy. William becomes the victor. Anglo-Norman period started.